Older prospects re-entering the draft for the first or second time provide an interesting set of risks and rewards every year. Players in their second or third trip through the process are older, more physically mature and closer to what they’re going to be as fully-fledged adults (or pro players). That said, the success they have in their preceding seasons could be seen as a product of their maturity rather than their talent – something that can disappear when they’re a young professional. Kale Howarth represents one of the most interesting dilemmas of the 2017 draft class. The lone Central Scouting-ranked player from the British Columbia Hockey League in the entire 2017 class, Howarth is in his third trip through the draft. 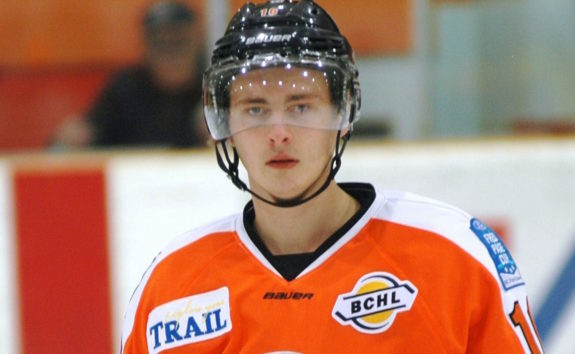 He ended up in the BCHL after not being chosen in the Western Hockey League’s draft. After a solid rookie season as an 18-year-old, he exploded offensively as a 19-year-old – doubling his previous offensive totals. That said, Howarth’s explosion put him 24th in BCHL scoring and a good deal of his production can be attributed to his prodigious size; at 6’5″ and 207 pounds, he’s already got NHL size. Howarth’s improved quite a bit over the past few seasons, particularly from a first draft eligible season that saw him put up just 11 points in AAA Midget. The fact that he’s put himself on the radar is impressive. His size and collegiate aspirations may get his foot in the door with NHL clubs, as a team selecting him would keep his rights until he leaves college. He’s committed to the University of Connecticut Huskies for 2017-18, so he’ll have time to continue to develop. Right now he’s a very raw player with a lot of question marks, but his big frame gives him a good base to build upon. Based on his age and size, Howarth could be a candidate for selection in the sixth or seventh round of the draft. UConn adds a big piece yesterday (literally) in 6-5 center Kale Howarth. Ranked by CSS, ’97 had 30g-28a in 51g in the BCHL this season. “Kale Howarth had a remarkable season for the Smoke Eaters and led them to their first playoff berth since 2011. The hulking six-foot-five centreman has quietly put himself in conversation with scouts after his effort at the CJHL Top Prospects Game, where he netted the game winning goal among his two snipes on the night. The Northern Michigan commit has displayed his physical presence all season and is a nightmare to move out of the goal mouth. He jumps on rebounds and uses his strong upper body to beat defenders in the corners and in front of the net. Has shown good hands around the net and is a coordinated skater for a kid his size.” – Marshall MacKinder, Hockey Now. Howarth has yet to win any major awards.